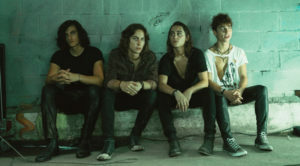 In the wake of the release of its debut EP, Black Smoke Rising, the hard rock act Greta Van Fleet announced dates for its first-ever headline U.S. tour. The band’s Zeppelin-inspired “Highway Tune” has become a hit on Active and Mainstream Rock radio. The tour also includes stops at several major rock festivals including Louder Than Life, Rock Allegiance, Open Air, the Aftershock Festival, Riff Fest and the Sonic Boom Festival. The band — singer Josh Kiszka, guitarist Jake Kiszka, bassist Sam Kiszka and drummer Danny Wagner — hails from the tiny town of Frankenmuth, Michigan. Sam Kiszka recently phoned us from the recording studio, where he said he was just “hanging out” and working on the tour’s set list. “The show will be tasty and tight,” he promised. The band came together about five years ago. What’s the story there? It all starts back in Frankenmuth, Michigan. Jake was the driving force. When he was in high school, he brought back a buddy he knew from jazz band. They started playing guitar and drums. That was really cool. Josh would go and sing on it. It was really sweet. My mom kept telling me that I looked like a bass player. It’s a weird thing to say, but my dad had a bass around and I picked it up and started learning some Motown licks. I was 12 or 13. Then, I went out and I started playing with my brothers. We never expected to be recognized the way we are. It’s amazing really. We just played in the garage because we loved it. I guess that’s still what we do. We wouldn’t be doing it if it wasn’t our favorite thing to do. Is there a music scene in Frankenmuth? I would say not particularly unless you’re talking about polka. We know a lot of great musicians. It’s a small town that not a lot of people know about. There are gifted musicians we love to have over and play with. How’d you decide upon the band’s name? It was a last-minute thing. We were going to play a local festival in town. It would be our first real show. Our old drummer came from breakfast with his grandpa. His grandpa said he had to chop wood for Gretna Van Fleet. We took out the “n” and it rolled off the tongue better. She’s cool with it, right? We wondered about it. It was on the marquee at town and everyone was calling her to see if she was playing. She showed up with her husband and they sat through a two-hour set of loud rock. She gave us the blessing. Prior to that, we had made jokes about her suing us. Josh has such a great voice. Did he receive any formal training? None of us have had formal training. He learned by ear, and I think that’s the best way to do it. It gets ingrained in your memory and becomes part of your being. I think that’s how people learn how to play. I just learned to do it by ear. I found out three months after I started playing that I was using the wrong bass tunings. I retuned it to standard, which I figured out, and kept going from it. Josh learned from Sam and Dave and Joe Cocker. He listened to a lot of funk and a lot of blues. He has a great style and has maximized his power. Do you think of ’70s rock bands like Led Zeppelin as inspirations? I would definitely say that’s a compliment. We listened to it all — the Beatles, Allman Brothers, the old blues guys like Howlin’ Wolf and Elmore James and Muddy Waters. It was great because our parents played us everything. We listened to our parents’ vinyl and classic rock stations growing up. How’d “Standing On” end up in a 2014 Chevy Equinox advertisement? We had an old publishing company way back. They got that song on the Chevy commercial and another song on an episode of Shameless. The version of “Highway Tune” on Shameless is a very old version. I played on it when I was 13 years old. It’s very weird. You recorded Black Smoke Rising at Rustbelt Studios. What was that experience like? We were in the studio for two years before the release. We had different stuff going on with management. We wanted to figure out a game plan in terms of getting our set up organized. We got a chance to experiment in the studio and record a lot of material. It was great fun. Al Sutton is the best rock producer I’ve ever met. Working with Marlon Young was great too. We honed our studio craft when we played around in the studio before we cut the EP. “Flower Power” has such a classic feel to it. It was a beautiful summer day and Jake started playing these two chords together. I had this old organ that had a sweet overdrive tone on it. I sat down on that thing and started playing along with it. Josh wrote down the lyrics as we went, and it went from us sitting there to a song in about five minutes. The song must have been floating around in the universe, and we snatched it up. It’s great when that happens. That’s a real magical experience. Talk about the title track. To what does the “black smoke rising” refer? If you ask Josh, he would say that you have to interpret it yourself. It’s a combination of archetypes of towers of evil. It’s a warning. It’s about how we need to stand together against what’s wrong in this world. I think it has a lot of meaning to all of us. We never get tired of playing it. Have you written the tunes for the next two EPs? I think that we are looking at a full-length album in the spring or winter of next year since our tour schedule is so heavy. We were originally going to do two more EPs. I want to get a full-length out. There are so many sides of Greta Van Fleet that people don’t know. I think a full-length is a great opportunity to show them to people. When we were in the studio for so long, we got a chance to record a lot of the stuff that we wrote for three or four years before we got into the studio. We have a lot of demos down and tracks we’re keeping. We have 20 to 25 songs that are contestants for the next full-length. It must be gratifying to see the band take off. It totally is. We really honed our craft playing bar rooms to 50 or 60 people every weekend. We would play four- or five-hour shows because we loved getting out here. We saw that we were communicating that rock ’n’ roll energy. We never thought this fun hobby would turn into this career. It’s an amazing thing.